The site is now running at a new home alongside nearby.org.uk. Please be patient if there a few things broken, we are currently testing all features to make sure they work. We don't intend to change anything - so the site will still look and work the same as it has always done - just with a new admin. All site functions, including registration of new users, should be now functional. Due to changing personal circumstances, I am not able to maintain this site any longer. As of 11 January 2010 I have suspended the registration of new users. I will leave the site otherwise intact. This is a community site, where registered users contribute to the content by publishing articles, uploading pictures, logging TP visits and condition reports and sending feedback on how they feel the site should be developed. Visitors may enter the 'User Area' but functionallity is restricted. Blue = There is a problem, see reports for more information. To read the reports, go to the 'User Area' (even if you are just a visitor). use 'Reports' then click on the YES link in the Reports column. A more detailed map using the latest data can be viewed here. Add your own reports to the database. Upload pictures to enhance your reports. Influence how the site develops. 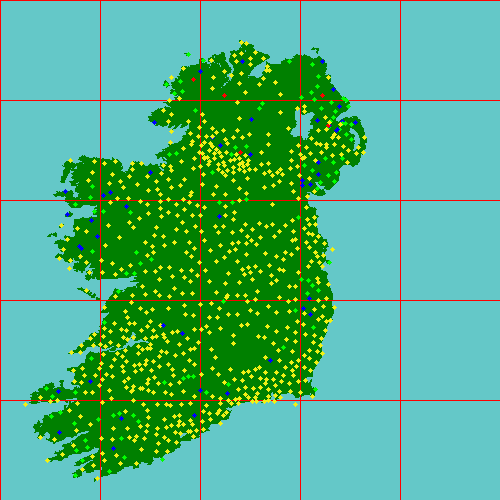 A GPS Exchange File (.gpx) containing all the TPs as waypoints. Lyons Hill | 2017-08-22 | N 976 276| Elev:0 | FB: | Pillar: | View: | J.R.
Lyons Hill | 2017-08-22 | N 976 276| Elev:0 | FB: | Pillar:Good | View: | J.R.
Owey Island (referred to as Moylemore on this site) TP is in very good condition, has no FB. 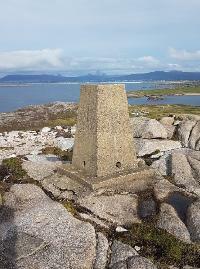 Took a 5 min boat trip from Cruit Island to Owey last month, walked from the pier to the highest point on the island and found, but was not looking for, the trig point. Views were magnificent from Tory in the NNE to Bloody Foreland, Errigal, Gweedore, the Rosses out to Arranmore Island to the SW. Had no camera with me, only the phone, got 2 photos only as I had planned to return some days later but that never happened. Very breezy that day but had a lovely picnic at the TP. Will return next year with camera. In surprisingly good condition, I wanted to say in "Good" condition but went for "Slightly Damaged" as the pillar edge is slightly chipped in the direction toward the "golf ball" transmitter, which would be NNW. 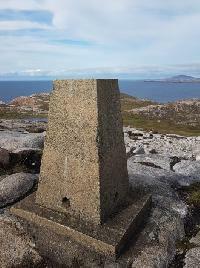 Otherwise the trigpoint is intact with the spider brass in place and all other holes hidden. As this is my first report, it did not occur to me to look for the FB No. so it is unfortunately "NR" for now..